Biologists classify canines as members of the carnivore (meat-eating) family Canidae. That family, made up of 30 to 35 species, includes wolves, foxes, coyotes, the dingo, jackals, and a number of species of wild dog. The family also includes the domesticated dog, which is believed to have descended from the wolf. Canines originated 38 million to 54 million years ago in North America, from where they spread throughout the world. Canines range in size from the fennec fox, which is about 16 inches (40 centimeters) long, including the tail, and which weighs 3 pounds (1.4 kilogram), to the gray wolf, which is more than 6 feet (2 meters) in length and which weighs about 175 pounds (80 kilograms). Canine skulls have a long muzzle, well-developed jaws, and a characteristic dental formula of 42 teeth. The social behavior of canines varies from solitary habits to highly organized packs that exhibit considerable cooperation. Most canines live in packs, which offers several benefits including defense of group territory, the care of the young, and the ability to catch large prey species. Texas and southern Louisiana. 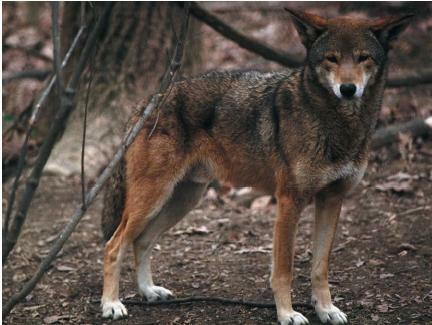 The red wolf is smaller than the gray wolf, and there is some evidence that it may be even a hybrid cross between the gray wolf and coyote. The gray wolf lives in packs and is a territorial species. Territories are scent-marked (that is, an animal will leave its personal odor to mark the boundaries of its territory) and may range from 50 to 5,000 square miles (130 to 13,000 square kilometers). Pack size is usually small, about eight members, consisting of a mature male and female and their offspring and relatives. When the pack size becomes large, a system of dominance hierarchy is established. The dominant male leader of the pack is called the alpha male and the dominant female is called the alpha female. Hierarchy is acknowledged among pack members through submissive facial expressions and body postures. Only the dominant male and female breed. Gestation (pregnancy) is about two months and the average litter size is from four to seven pups, who are born blind. The young reach physical maturity within the year. They do not become sexually mature until the end of their second year. The nonbreeding members of a pack help protect and feed the young. Wolves prey on deer, moose, elk, and beavers. Besides scent-marking, wolves communicate by howling. Scientists believe that howling informs pack members of each other's position when they are separated from each other and warns off other packs from the territory as well. During spring and summer, the wolf pack remains within its territory. Wolf pups are raised during this period. During autumn and winter, the wolf pack travels widely, often following the migration of species on whom they prey. There are 21 species of fox. Foxes range in size from the 3-pound (1.4-kilogram) fennec fox to the 20-pound (9 kilogram) red fox. The gray fox and arctic (or white) fox are highly valued for their pelts. The socalled silver and blue fox are actually color phases of the arctic fox. Other fox species include the kit fox, the swift fox, crab-eating South American fox, and the sand fox. Foxes have a pointed muzzle, large ears, a slender skull, and a long bushy tail. They are territorial and, like wolves, scent-mark their territories. Foxes also communicate by vocalizations such as yapping, howling, barking, whimpering, and screaming. Foxes use stealth, and dash-and-grab hunting techniques to catch their prey. They are generally solitary hunters, and most species feed on rabbits, rodents, birds, beetles, grasshoppers, and earthworms. The bat-eared fox of Africa eats primarily insects, although it also includes fruit and small animals in its diet. Foxes mate in winter, with the female producing an annual litter of one to six pups after a gestation period of fifty to sixty days. Foxes are heavily hunted for their pelts and to prevent the spread of the viral disease rabies. Some attempts to develop oral vaccination for rabies have been successfully used in Switzerland and Canada. 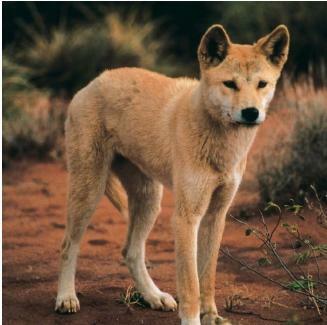 Coyotes, jackals, dingoes, and a number species of wild dog comprise the rest of the canine family. The distribution of coyotes ranges from Alaska to Central America. Their populations have flourished as wolves have been eliminated. They have a tendency to interbreed with wolves and with domestic dogs. Coyotes prey on small animals, but will eat whatever is available to them, including carrion (dead meat), insects, and fruit. Coyotes reach maturity during their first year and produce a litter of six pups. While the basic social unit of coyotes is the breeding pair, some coyotes form packs similar to wolf packs and scent-mark a territory. In the United States, coyotes have been responsible for considerable losses of sheep. Four species of jackals occupy ecological niches normally filled by wolves in warmer parts of the world. They are found throughout Africa, southeastern Europe, and southern Asia as far east as Burma. The four species are the golden jackal, the simian jackal, the black-backed jackal, and the sidestriped jackal. The golden jackal is the most widely distributed of the four species. The golden jackal prefers arid grasslands, the silverbacked jackal prefers brush woodlands, the simian jackal prefers the high mountains of Ethiopia, and the sidestriped jackal prefers moist woodlands. Jackals have a varied diet of fruit, reptiles, birds, and small mammals. Jackals are unusually stable in their breeding relationships, forming long-lasting partnerships. They also engage in cooperative hunting. Jackals are territorial and engage in scent-marking, usually as a unified male and female pair. They also participate in raising their young together and tend to remain monogamous (staying with the same mate). Jackals communicate by howling, barking, and yelping. In Ethiopia, the simian jackal is an endangered species because it has been killed for its fur. Other wild canines include the Indian wild dog dhole of southeast Asia and China; the maned wolf; the bush dog of Central America and northern parts of South America; the dingo of Australia; and the raccoon dog of east Asia, Siberia, Manchuria, China, Japan, and the northern Indochinese peninsula. In Africa, the cape hunting dog has a distinctive black, yellow, and white coat and large ears and hunts in packs that can overpower any game species. Kennel societies in the United States recognize 130 breeds of domesticated dog, while kennel societies in Great Britain recognize 170 breeds, and the Federation Cynologique Internationale (representing 65 countries) recognizes 335 breeds. Domestic dogs range in size from about 4 pounds (2 kilograms) to more than 200 pounds (100 kilograms). Some breeds, such as the dachshund, have very short legs, while others, such as the greyhound, have very long legs. For dog owners, these animals serve a number of different purposes. Pet dogs provide companionship and protection, while others herd sheep or cattle or work as sled dogs. Police use dogs to sniff out illegal drugs and to help apprehend criminals. Dogs are also used for hunting and for racing. Guide dogs help blind people find their way around. Female dogs are first able to reproduce, at the age of anywhere from seven to eighteen months. Gestation lasts about two months, and the size of a litter is from three to six puppies. Like other canines, puppies are born unable to see. They develop that sense in about twenty-one days. At about the age of two months, puppies are less dependent on their mothers and begin to relate more to other dogs or people. Typical vocalizations of domestic dogs include barking and yelping. History of domestication. About 5,000 years ago, human civilization changed from a hunting-gathering society to a farming culture, and the domestication of the dog began. Scientists believe that all breeds of domestic dogs, whether small or large, long haired or short haired, are descended from a wolflike animal over several millions of years. Domestic dog breeds have been produced through selective breeding. Unlike the wolf, the dog is treasured by humans, as indicated by its nickname as "man's best friend." Dog stories abound in children's literature, from Lassie to Rin Tin Tin, and politicians, like Presidents Franklin D. Roosevelt and Richard Nixon, used their pet dogs to enhance their images. Hunting and the destruction of habitat have endangered some species of canines. Their reputation as predators has added to efforts to eradicate them from areas where livestock are raised or where they live too close to urban populations. Some rare wild dogs, such as the jackal of Ethiopia, are few in number. The maned wolf of Argentina and Brazil has a population of no more than 1,000 to 2,000 members. A successful effort has been made to reintroduce the gray wolf into national parks in the United States, but this effort is opposed by many people, particularly local ranchers. Hi, I have a question about the difference between a coyote and wolf. I live in Minnesota, while hunting I was approached by five wolf or coyote? Four of them black and one white, all of a sudden on the trail back to camp the alfa wolf came about five feet in front of me and four of the other wolfs behind, as he slowly charges me he had a vicious grawl with teeth sharp wide open. I raised my bow for deer archery to protect myself and he just turned around and ran off. Scared the heck out of me cause in my mind I thought I was going to be dinner for them tonight. They were the size of a dog, about waist high. My question is was it coyotes, wolf or other animal in the canine? Hi you can just call me Nelly but today I just saw something on the bike path behind my house. It looked a lot like the red wolf, but I live in Minnesota. How can that be? I know a lot about animals but this confuses me. My dad says its a fox, but he didn't see it. my mom and I just described it to him. My little dog Daisey started running towards but I luckily stopped her because one of them started coming at her. It saw me and ran. There were 2 of them. Please, if possible, e-mail me back and tell me what it could be. Please send pictures so I can idetify.I need to know if my dogs are in danger. They are both small. i love reading about canines!!! it makes wanna learn more about these wonderful animals!!!! please continue to put stuff about htem!!!!!!!!!!!!!!!!!!!!!! I want to clear up an argument. My grandsaon's teacher marked his essay wrong because he referred to a fox whilst relating a story about the African bushveld. We knew this animal (we lived in Zimbabwe and visited the Hwange National Park frequently) and it was known as the silverbacked (or Cape) fox. The teacher, here in Australia, told my grandson that there are no foxes in Africa unless introduced by European Settlers. I have never known of a red fox or any other northern hemisphere fox living in Zimbabwe. I know this reply is very late, and your grandson probably has a different teacher by now, but he WAS right, there are foxes in Africa. In southern Africa there are Cape Foxes (Vulpes chama) which are "true" foxes, and bat-eared foxes (Otocyon megalotis), which are in a genus of their own. You might be mixing Cape foxes up with silverbacked jackals, also known as black-backed jackals (Canis mesomelas).